Does filing bugs on Microsoft Connect for SQL Server work? In a word; YES! In a lot more words, not always in the way that we want it to, but there are plenty of cases where it actually works and changes are made to the product as a result. Now with that said, it doesn’t work all the time, and it helps to realize that what is important to us as an individual user might not be important to the product as a whole. Before you post comments, I am sure that there are plenty of cases out there where people can say that Microsoft Connect for SQL Server is broken. I have personally been irritated to the point of posting negative comments on Twitter about the whole Connect process. I feel that it is about time that I show the other side of the story as well and talk about some Connect successes that have occurred in the past year, and of course what better topic to do this with than Extended Events. Over the next few weeks, I’ll post a couple of different examples of Connect actually working and bringing about changes to the product that are beneficial to the community, starting with this post. 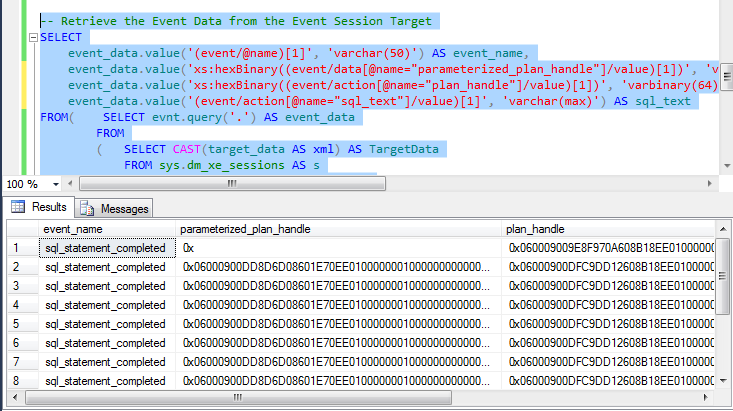 This Connect item is actually incorrectly titled and is based on some confusion about what the sqlserver.plan_handle action actually returns when executed in the engine. 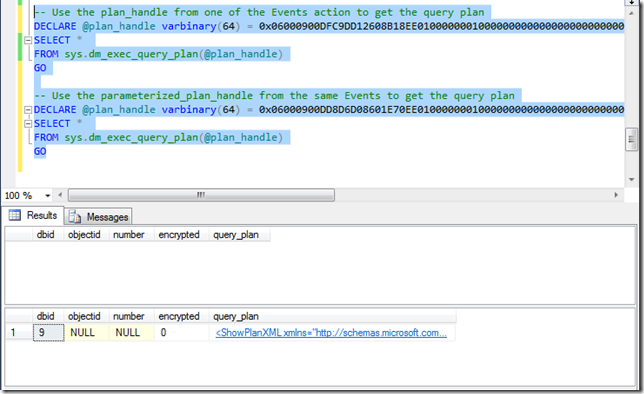 I blogged about this with much more detail last year in my blog post; What plan_handle is Extended Events sqlserver.plan_handle action returning? If we look at the output of this, we will get the parameterized plan handle for each subsequent call of the statement after the initial call caches the parameterized plan into the cache. 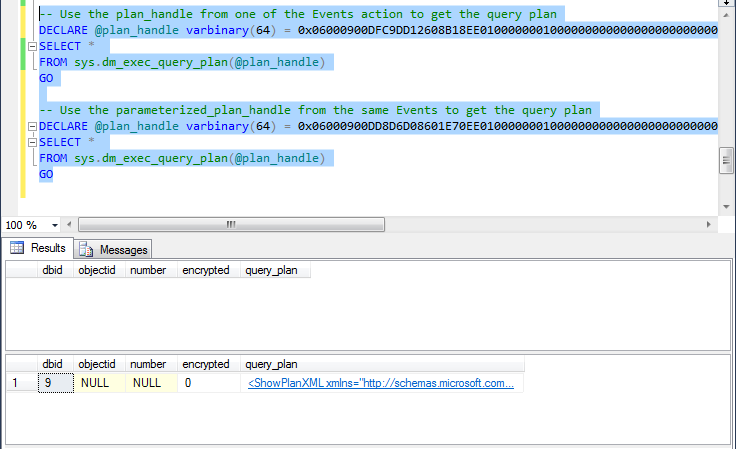 Now, you might point out the different lengths of the plan handles in the above two queries. If you look back at the source, the same code is being used to perform the xhexBinary conversion in the XML so the values are exactly the same as what was originally provided by the event and the action. The non-parameterized plan is not cached because it is not likely to be reused, which is why we have the auto-parameterized plan in cache. th template will work correctly once saved. This will at least let you play around with this while Microsoft works out the bug in the template XML. A copy of the corrected file is attached to this blog post as well. 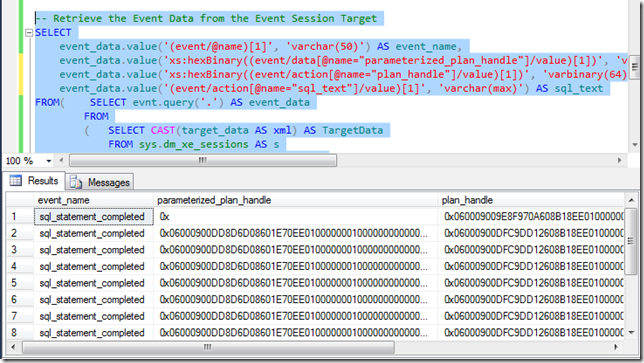 Tracking Problematic Pages Splits in SQL Server 2012 Extended Events – No Really This Time! Just over a year ago I blogged about the enhancements that were made to the sqlserver.page_split Event in SQL Server 2012 to make it easier to identify what the splitting object was and the type of split that was being performed. Sadly what I discovered writing that post was that even with the extra information about the split type, the event didn’t give you enough information to really focus on the problematic splits that lead to fragmentation and page density issues in the database. I didn’t do a whole lot with this again until recently when a question was posted by Ami Levin (Blog | Twitter) on the MVP email list that commented that the page_split event was broken in SQL Server 2012 based on a presentation he’d seen by Guy Glantser (Blog | Twitter). Let me start off by saying, the event isn’t broken, it tracks page splits, but it doesn’t differentiate between an end page split that occurs for an ever increasing index, versus a mid-page split for a random index that leads to fragmentation and page density issues in the database. Both of these are technically splits inside the storage engine, even if we as DBA’s don’t really care about the end-page split for a increasing key value like an IDENTITY column in the database. I had Ami pass my information along to the presenter and we traded a few emails on the subject of tracking splits with the specific focus on trying to pull out the mid-page, fragmenting splits. While going through things for the third time, it dawned on me that this is incredibly simple, based one of the demo’s that was sent to me. Just over a year ago, I also blogged about tracking transaction log activity in SQL Server 2012 using the sqlserver.transaction_log event, which can be used to track mid-page splits in a database. Last year when I wrote about the sqlserver.transaction_log event, there were 10 columns output by the event in CTP1, but as of RC0, the events output has changed and only 9 columns are output by the event. With the map_key value, we have a couple of ways to collect the information with our targets. We could collect everything into an event_file, but that doesn’t really make sense for this event. Instead the best target for this type of information is the histogram target which will bucket our results based on how we configure the target and tell us how frequently the event fires based on our bucketing criteria. If we don’t know anything about the server in question, we can start off with a very general event session that has a predicate on the operation only, and then aggregate the information in the histogram target based on the database_id to find the databases that have the most mid-page splits occurring in them in the instance. If we startup this workload and allow it to run for a couple of minutes, we can then query the histogram target for our session to find the database that has the mid-page splits occurring. With the database_id of the worst splitting database, we can then change our event session configuration to only look at this database, and then change our histogram target configuration to bucket on the alloc_unit_id so that we can then track down the worst splitting indexes in the database experiencing the worst mid-page splits. AND database_id = 8 -- CHANGE THIS BASED ON TOP SPLITTING DATABASE! With the reset performed we can again start up our workload generation and begin monitoring the effect of the FillFactor specifications on the indexes with our code. After another 2 minute period, the following splits were noted. With this information we can go back and again attempt to tune our FillFactor values for the worst splitting indexes and rinse/repeat until we determine the best FillFactor for each of the indexes to minimize splits. This is an incredibly powerful tool for the DBA moving into SQL Server 2012, and will definitely change how we perform index fragmentation analysis and troubleshoot problems with excessive log generation in SQL Server 2012 onwards.